As the world continues to mourn the loss of both Carrie Fisher and her mother, acting legend Debbie Reynolds, a lost scene from last year's Star Wars: The Force Awakens has started making the rounds. This deleted scene was never before made available online, and is from the more recent special edition Blu-ray that came out before the holidays. It is one of a few missing scenes that prominently feature Carrie Fisher's iconic Princess Leia, who is now a General in the Resistance. In The Force Awakens, there was simply too much story going on to fully explain General Leia's estrangement from the democratic senate of the New Republic. But this deleted moment offers some insight into where Leia is at this point in her life. The gist of the matter is, Leia simply doesn't care about other people's opinions when it comes to her role in the senate, which is a classic naunce and keeps General Leia perfectly in sync with the Princess everyone knows and loves from the first three Star Wars movies. Shortly after Carrie Fisher's passing on Tuesday, it was widely reported that a new 'deleted scene' had been released on Youtube. But that is not necessarily the case. It will be new to anyone who didn't feel like paying extra money for the 3D Collector's Edition Blu-ray that arrived on October 31, following a release that many fans had already purchased. Interestingly enough though, there are still General Leia deleted scenes that have not yet publicly surfaced and are still locked in the Disney vault. One such scene was included in many of the TV spots and trailers leading up to the movie's release last year. It showed Maz Kanata handing General Leia her brother's old blue lightsaber, which he'd lost on Cloud City. It isn't known if that scene will ever make its way onto another release in the near future. With Carrie Fisher's devastating loss this past week, many fans have been wondering how her character will be handled moving forward. It has already been confirmed that all of the General Leia scenes with Carrie Fisher have been shot and completed for Star Wars 8. Leia is said to have a much more substantial role in this next chapter in the Skywalker saga, yet she is still not a main player in the overall narrative arc. 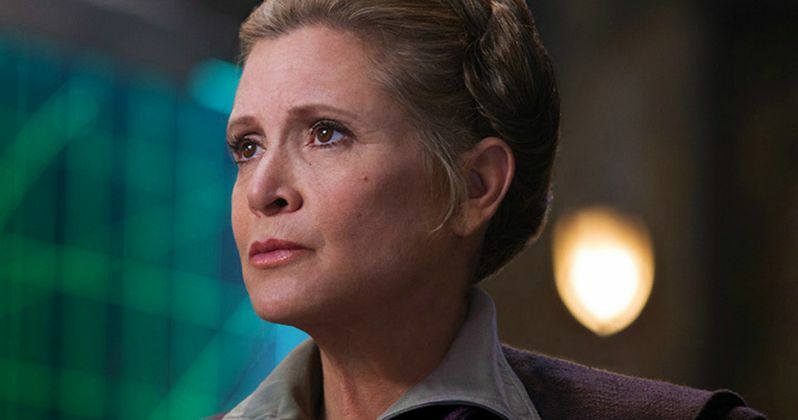 No discussions have been made about where Leia will go in Star Wars 9, and we probably won't know how that will be handled until after Star Wars 8 comes out. Some have speculated that they will use a CG version of Leia in Star Wars 9, but there was much backlash over the use of a CG Leia in this past month's Rogue One, which caused some serious fan outrage. In the official cinematic Star Wars canon, Leia's disagreements with the senate are revealed to be directly connected with her family relationship to Darth Vader, who is her biological father. This is all discussed in the tie-in book Bloodline, which hit stores earlier this year. For now, we have this deleted scene, which helps explain the story a little better, and gives us a little more Carrie Fisher at her finest.